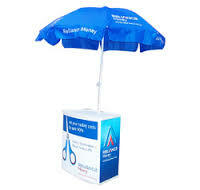 With the aid of our highly experienced professionals, we are instrumental in developing premium grade Plastic Promo Table. Made from premium grade plastic at our modernized setup the offered tables come with eco solvent printing which works best for rugged use. Designed especially for promotional purpose these tables sturdy and easy to carry, which makes transportation easy. We have gained specialization in procuring the best suited inventory of raw material from recognized sources and developing these tables as per set industry standards and our prestigious clients can avail these tables from us at the best price.